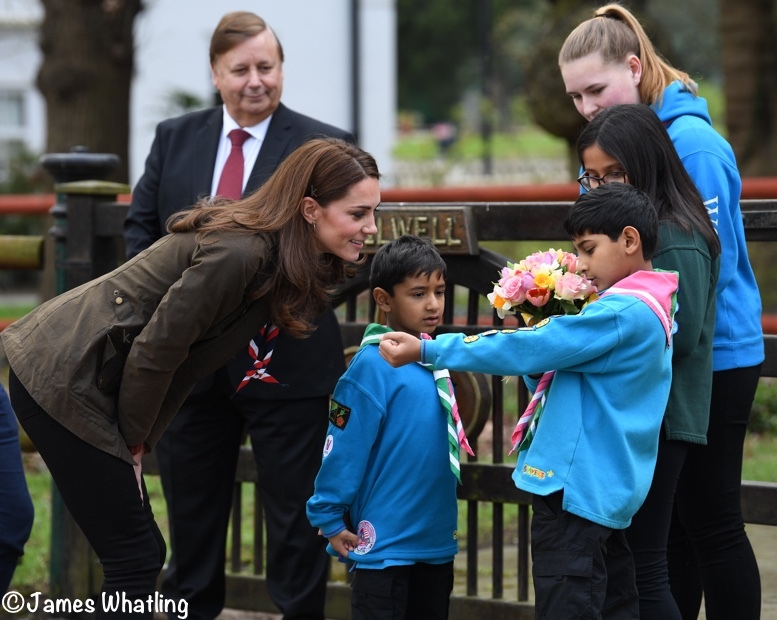 Kate was also greeted by several young Scouts and had a look at some of their merit badges. A quick video from Roya Nikkhah of The Times. 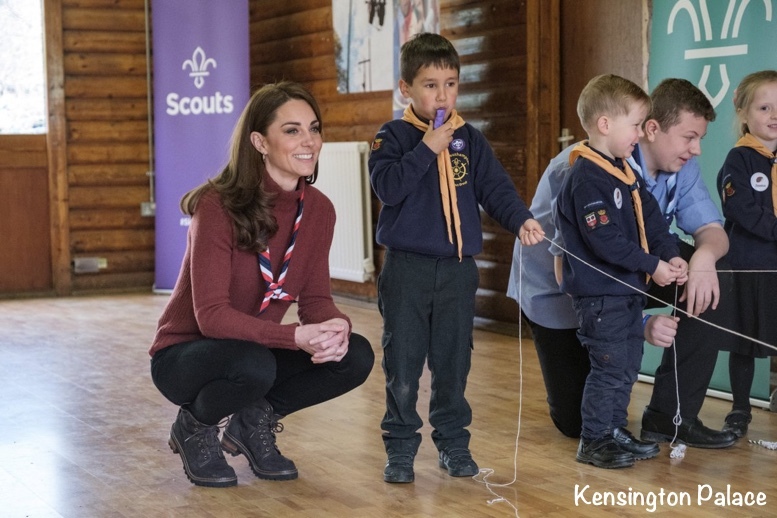 The Duchess is a volunteer with the Scouts and has taken part in many engagements with the organization, including a snowy training exercise at Great Tower Scout Camp in 2013, and a Cub Scout meeting in 2016. The Queen is the royal patron of the Scouts. 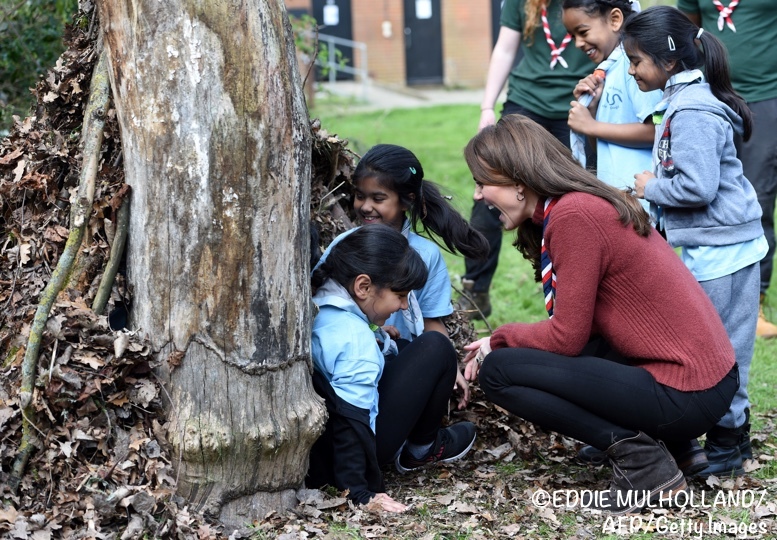 The mom of three, who was a Brownie as a young girl alongside her sister Pippa Middleton, paid a visit to the Scouts’ headquarters on the outskirts of London on Thursday to see the youth movement’s new program for 4 and 5 year olds. 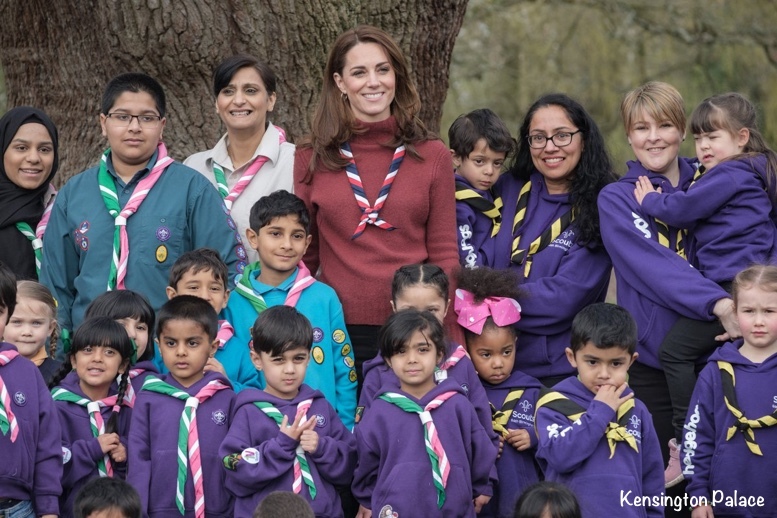 UK Scouting currently reaches 473,000 young people between the ages of 6 and 25. 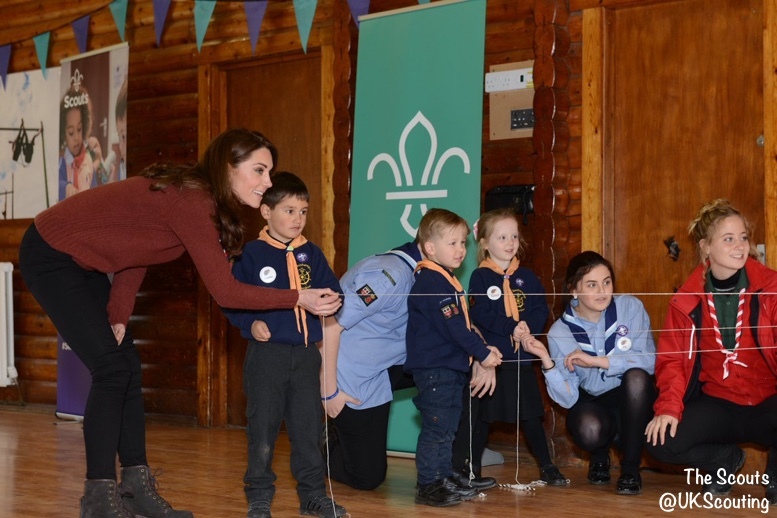 Kate spent time with parents and leaders and children from three areas of the U.K. who are taking part in trials for a new pilot program for the youngest Scouts. The pilot has been exploring the potential of providing Scouting to children between the ages of 4 and 6 as research has shown that the first five years of a child’s life are more important to the development, and future health and happiness, of a child than any other single moment in their lifetime. One of the program activities was making balloon rockets. Then it was time to test them. Another activity was boat building; I think this young man was working on a sailboat. 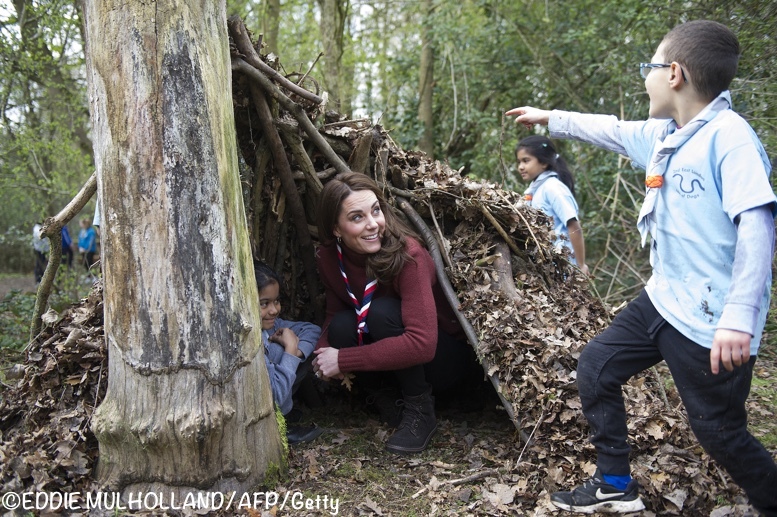 Kate looked at a den made by the children, constructed with twigs, sticks, and leaves. …joking that she hoped it was waterproof as it was doused from above by some of the scouts. Explorer Scout Tahseen Patel, 17, gave Kate a tour during her visit. 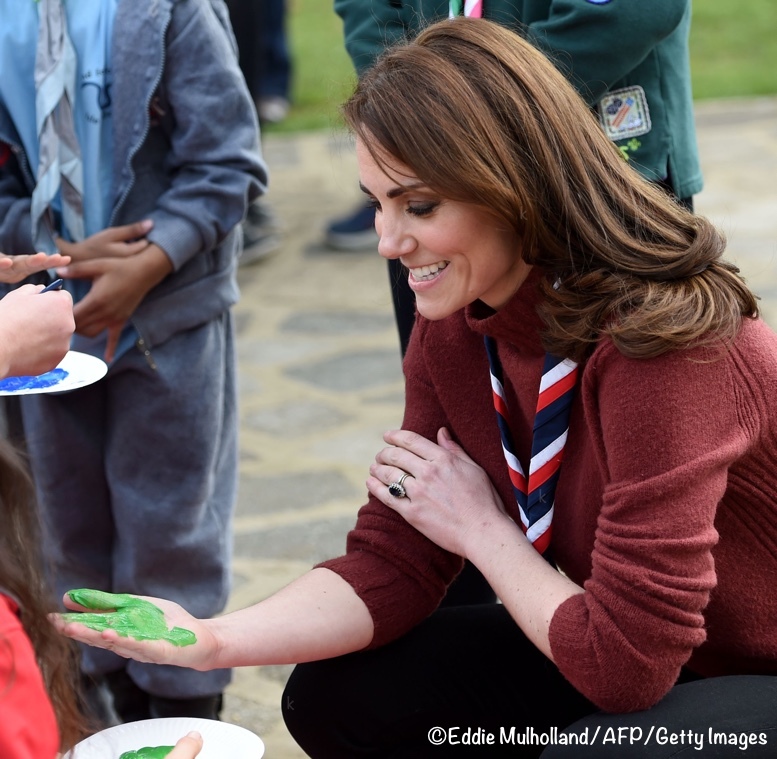 Kate’s hand was painted by the scouts during today’s session. 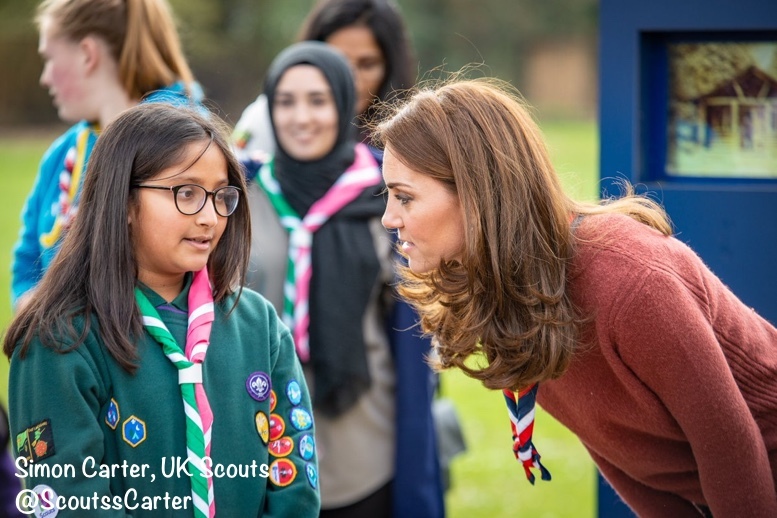 The Duchess chatting with a scout. Today’s event was at Gilwell Park, recognized internationally as the home of Scouting. 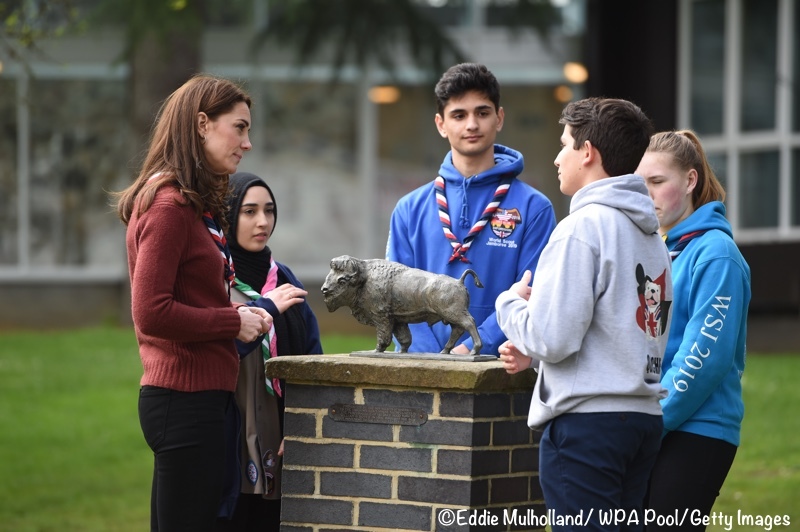 Today a group of Scouts ages 14 to 18 showed the Duchess some of the Park’s iconic features. 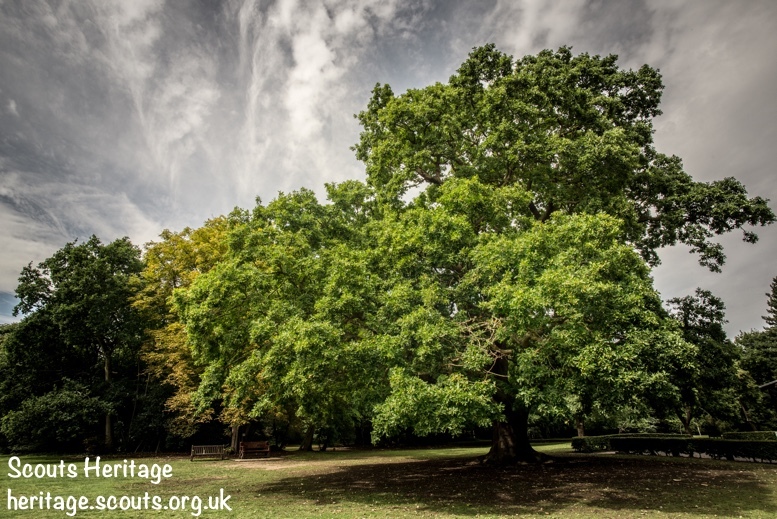 Among the many points of interest: the famous Gilwell Oak, named UK Tree of the Year in 2017. 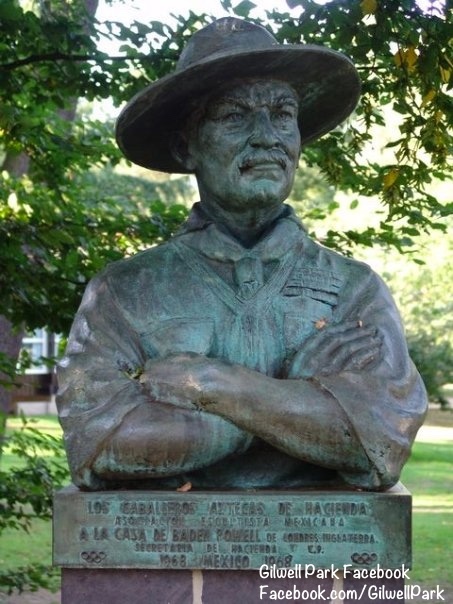 Below, a statue at the park of Lord Baden-Powell, the founder of the Scouts movement. The park is a Scout campsite, training and adventure center, and home to the organization’s U.K. headquarters. Gilwell Park is marking its 100th anniversary this year. 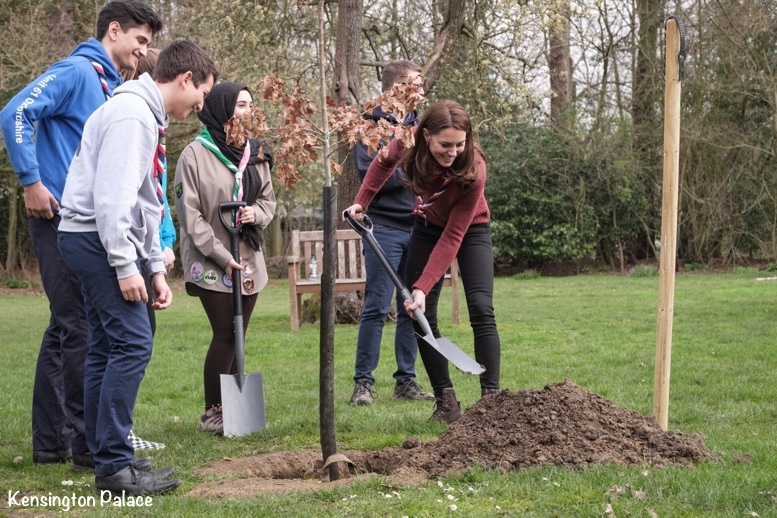 To mark the anniversary, the Duchess planted a much smaller oak, a sapling. Now to our look at what Kate wore. We’ll start with her Barbour jacket. It is the brand’s Defence Jacket, a piece the Duchess has had for many years. It is one of the brand’s utility jackets, with a high collar, storm-fly front placket, snap-shut bellows-style pockets, epaulets, and a tartan cotton lining. Like many Barbour pieces, the jacket has a waxed coating that provides better protection from the elements. That water- and wind-resistant coating can be reapplied. The company recommends doing this every year, although some of us let it go a little longer (cough-cough) than that. Below left, a can of the coating at Orvis ($19) for those industrious enough to reproof pieces at home. Many of us send pieces directly to Orvis and have it done by the company. 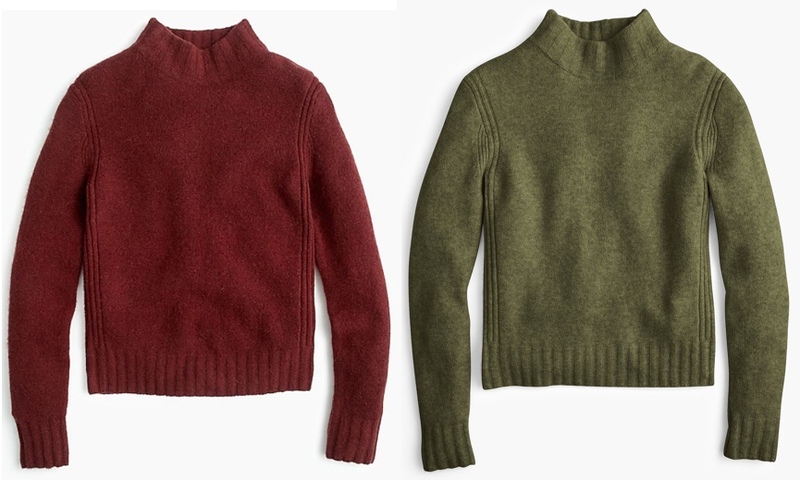 The Duchess also had on her Mockneck Sweater in Supersoft Yarn ($49.99) from J Crew. The official color name for the piece worn today is ‘mahogany.’ Kate also has the sweater in the loden green colorway. It is a nylon/merino wool/alpaca/elastane blend, and available in a wide range of colors. A number of WKWers have purchased the sweater, and their reviews have been very positive. UPDATE: While many have been pleased with their sweaters, not everyone is thrilled with the quality. There is a thread on the Facebook page with input on size, quality and other issues. I don’t have a firm ID on Kate’s trousers. I have seen suggestions they are the Zara pair she has worn before, but they do not have the stud on the back pockets the Zara pair has. Kate wore her See by Chloé Liegi Ankle Boots. The combat-style boots are suede with leather trim and a chunky sole. 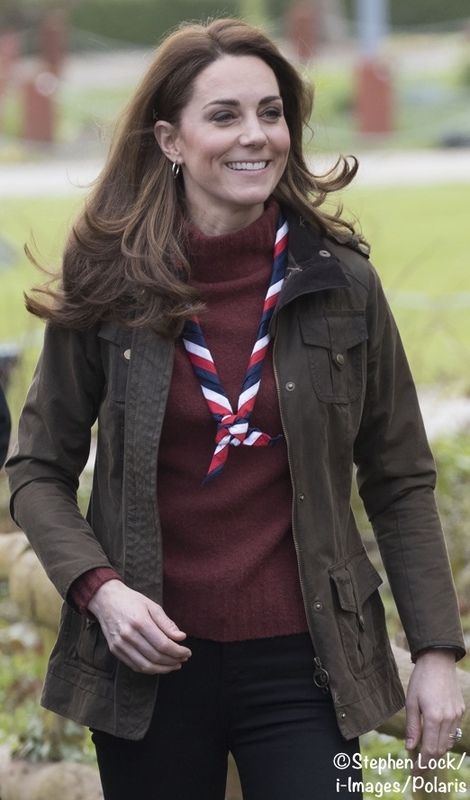 She sported the official UK Scouts Adult Scarf (£8.50). It is “…blue with a red, white and blue border and a Union Flag badge on the apex.” Our thanks to Elizabeth at Kate’s Closet for the scarf information. The Duchess wore a pair of earrings we’ve not previously seen. They look like they might be sterling silver with three tiny segments in a gold tone. At this point they are unidentified. UPDATE: Because the Defence Jacket is such a popular piece, I have added some options to the repliKate Outerwear page. This Royal Family Channel piece runs about 4:20. This PA video runs about 45 seconds. just love the look and is so outdoorsy and fun. The boots are fabulous and so servicable for such an event, love the skinny jeans and the hip skimming jumper. An elegant and well put together outfit that screams fun, laughter, fitness and outdoor fun. She is in her element, surrounded by children and in the outdoors. She was so relaxed and seemed to enjoy herself immensely. Her hair was amazing and her outfit cute and so appropriate for the event. But what I loved the most was that darling flower arrangement in pink and yellow. What a cheerful arrangement and I think I’m going to try and recreate it this weekend! Any ID on the earrings yet? Really like them! I was referring to the ads for their new children’s clothing line. Totally agree that our beautiful Kate navigates her sartorial choices superbly. Ooh, any replikates for those boots?! I can totally see them being a Duchess favorite! Check out the Taos Crave boot. I’m totally getting it once it’s back in stock in my size. These are all great pieces and Kate looks very put together but casual and relaxed at the same time. Her casual looks are some of my favorites of hers. I really like the colors in todays ensemble, theyre so flattering. She seems to really enjoy this, it does look fun! I never got to participate in girl scouts as a kid, I feel like I missed out so events like this one and other outdoorsy ones really interest me. 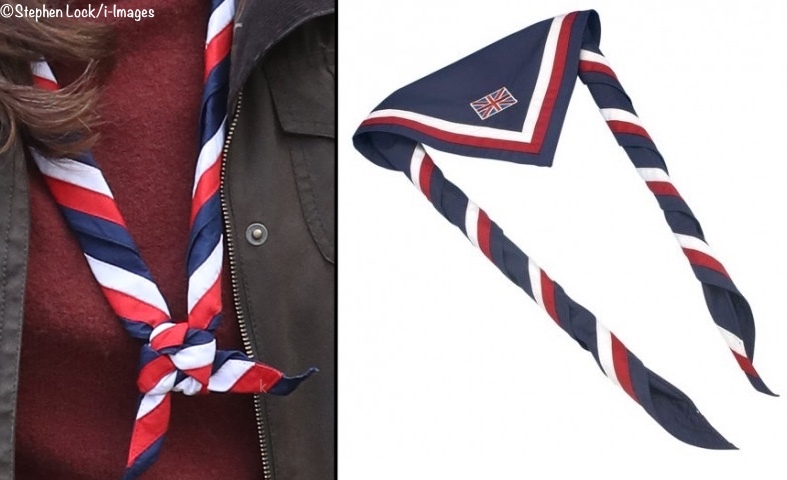 I’m curious.. do UK scouts sell cookies or something similar like the US scouts? 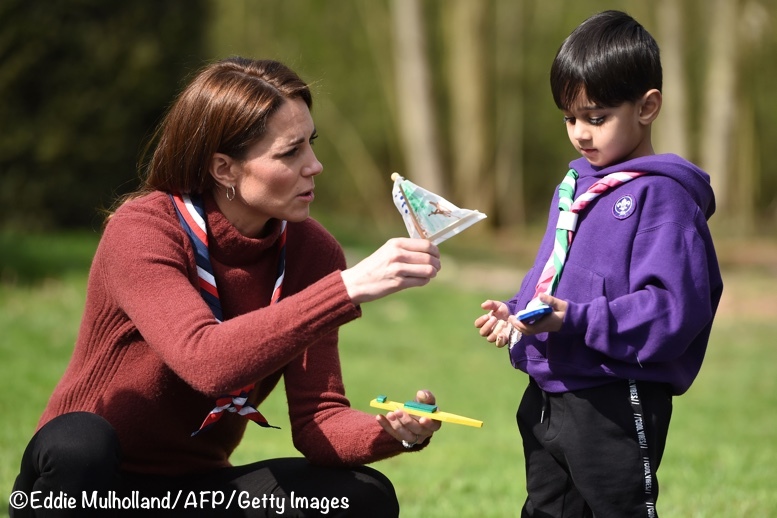 In the UK, Scouts (formerly Boy Scouts) is now co-ed. UK Girl Guides, which would be the USA equivalent of Girl Scouts, do not sell cookies as a fundraiser. However, Girl Guides of Canada do sell cookies and the spring campaign has just started. Great question! Also what is the name of the youngest scouts? In the US I guess it would be the Brownies? Thanks for clarifying it. Cute names! I love hedgehogs! sue d. Just to be clear, WAGGGS, the World Association of Girl Guides and Girl Scouts, is a totally separate organization from WOSM, the World Organization of the Scouting Movement. In England, Robert Baden Powell, founded Scouts for boys in 1908. In 1909, when girls demanded to be involved, he asked his sister, Agnes to oversee Girl Guides, for girls. In the USA, they call their Guiding members, Girl Scouts. After BP married Olave Soames, she led the girl’s organization. Although based on the same principles and values, WAGGGS and WOSM differ, in that initially one was a program for females and the other for males. In recent years Scouting has gone co-ed; they have always had both men and women as leaders. Guiding remains all female, in its membership and its leadership. Wow! Thank you so much for the wonderful info on the Girl Guides, etc. Fascinating! The youngest Girl Scouts in the USA are (were) Daisies. Not sure about now but the youngest USA boys were Cub Scouts when I was growing up. Brandi, if you missed out on Brownies as a kid you can still join as an adult volunteer. I’ve recently joined as a Beaver Scout leader and love it. You don’t have to lead a group, you can volunteer at different levels. And you get to wear a neck scarf like Kate. 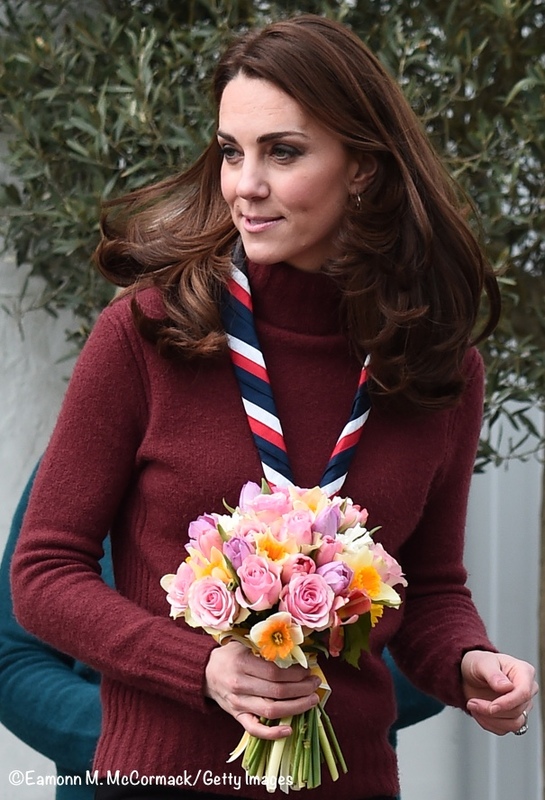 It was Kate’s involvementvthat made me think about volunteering in the first place. Always love reading everyones comments – I always learn something, notice something I didnt before and most important feel less silly when i admit I was up till 12:30 last night looking at earrings 🙂 I love when Kate goes casual and this looked like such a fun day. I usually dont care for the legging but this pair looked like a better fit and I thought the whole outfit look great. Now back to looking for those earrings! Me too! I requested it for my birthday last week. It’s funny how it makes the item a little more special knowing I saw it on DOC first – I guess that’s the Kate Effect (elevating regular people and making us feel a little more ‘royal’, more special somehow). It’s fickle but I don’t care. The thing I’d let people know about the jumper if they’re looking to buy, is that the sizes run large and the torso is quite long. I don’t think you can quite get the sense of how long because Kate has quite a long torso herself. But on me – a pretty standard proportion – the jumper sits well below the hip bones. It’s also quite fine and soft and has stretch in the fabric, so you could buy a few sizes down. This is good to know! One of the reasons I love following WKW is that I also have a long torso. It’s so helpful to see what works and doesn’t work and to find brands or styles that I can work with, too. Thankfully, this jumper is one of those repliKates that is within reach! There is something reassuring about seeing a nicely dresssed person calmly and happily going about her business naturally without trying to make any statements. I don’t like to stray beyond her clothes too much but Kate’s cheerful get-on with it attitude is refreshing. She looks great for the occasion. Well groomed wearing appropriate and approachable clothing. I love those boots. She’s made some good shoe investments lately and these are right there at the top. I agree completely! I think Kate thinks about her clothes, but not too much if you know what I mean. She is well aware of which situations are going to be history photo ops (Christenings, arrivals at foreign countries etc) and takes great care to make sure the entire family is appropriately attired for the event and so that the photos are perfect, but for the rest of time she appears to wear what she likes within the confines of her role. One thing I have noticed is that since Natasha Archer has gone on maternity leave I have liked Kate’s day wear much more. Could just be a coincidence of course as it also sort of coincides with her return from maternity leave. She seems to have greater confidence and presence than she did before Louis was born. The comparisons to the Queen Mother seem very appropriate and are quite a compliment to how hard Kate has worked to develop her role. The Queen Mother came from an aristocratic family and grew up around the royals. Kate had none of that early experience to draw from. Again, her “get on with it attitude” along with what seems to be incredibly in depth preparation for every event makes her a real asset to both the Royal family and her charities. She looks perfect for a fun day outdoors – I just really hope that the pants are not Zara. I am really disappointed in their recent ad campaign. Not that Kate would be aware of it, but I do think it is best that she does not support that brand in the future. I would suspect Kate is very aware of her fashion choices, or at least, she has a stylist who has to stay on top of it for her. I know there was some controversy a few weeks ago, but I suspect the Duchess already had the ensembles planned and didn’t foresee how sensitive the timing was when she wore those outfits back to back. For someone who has been in the public eye as long as she has now, Kate has really done a superb job navigating her sartorial choices. I just watched the videos for 2018 and 2019 (Here: https://www.youtube.com/watch?v=REypLXTRzl4) and, while they were a little weird, I’m not sure what is offensive about them. just watched the Zara ad campaign, have I missed something? …..all I can see in the link is a girl in clothes surrounded by curtains. 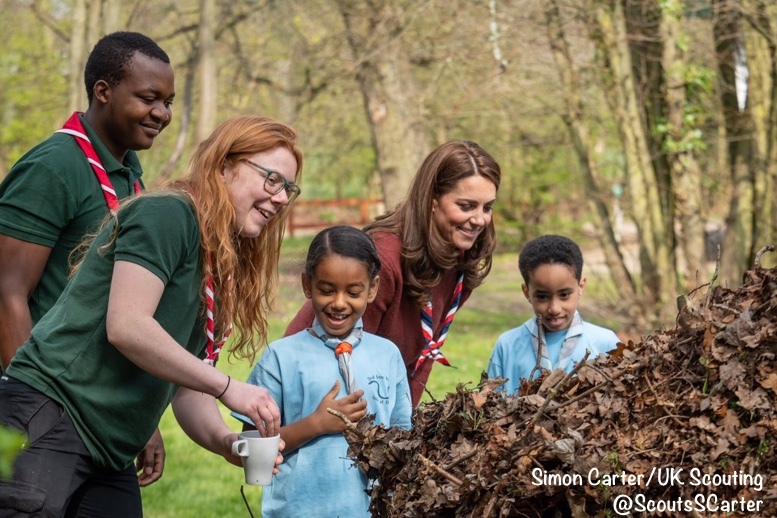 There’s something very outdoorsy and down to earth about Kate and she always seems to be in her element at these types of engagements. I think she looked really nice and I enjoy seeing her with the little ones. She’s very natural and relaxed with them. I always think she seems ever so slightly self conscious at formal engagements, but appears totally at ease at more casual events, especially with kids. I really love the whole outfit, especially the hoop earrings, but just can’t stand skinny jeans. I just think straight leg or slim cut are so much more flattering. These look like leggings. I am a fan of your page and always read kate’s updates here and the IDs. Never commented before. Thanks for always giving such a great coverage. Kate’s earrings give me a surprise too as I know she hasn’t wore them before but Princess Diana image stick in mind where she wore something like this. Could those be hers? I haven’t done any search and I am not really good at that. She’s just so charmingly comfortable with everyone. When she asked the little boy to help her up, I think I melted inside a little. Same when she asked the other little boy what badge he was most proud of. I like the predictability of her outdoor wear, but that J. Crew sweater looks as pilled as mine does. Something about that blend, I suspect. Also, she doesn’t seem comfortable with the length as she tugs on it now and again. I’m obsessed with the earrings; in fact, I spent wayyyyyyyyyy too much time today looking for them only to fail miserably. Either I’m really bad at this game, or those are old or borrowed (from Mom or Pippa) earrings. I love them and was pleased not to see the usuals. If anyone knows what they are or can find them, I’d be so happy, just giddy, really. All in all, a wonderful Kate-ish type day. I’m also thinking those earrings are a sentimental gift from someone. They don’t look very modern to me or like something she would typically wear, but hoops are making a comeback. 🙂 I think they were a sweet touch that also help to keep the focus on what she was supporting, not what she was wearing (ironic statement given what I’m posting about, I know). I think this sweater is a little short. I bought it in the green in my normal size and while it fits everywhere else, I’m always pulling it down. I do love this outfit though! This red color was sold out in my size for both runs and I’m bummed. It’s a great shade! I also have the fjallraven sweater in the purple and the j crew sweater is much softer. I’m dying for those boots! Kate looks absolutely in her element here, it’s a joy to see her having so much fun. I can’t get over that she had to get right inside the little kids’ den. The earth tones in her outfit suit her well, especially the lovely J Crew mahogany which is not always an easy colour to find. Her trusty Barbour is a great fit combining style with practicality as do the sturdy combat boots which I’m glad to see on repeat, I think they’re a great design of that type with their chunky sole and heels. It’s great to see her show off those long slim legs in a skinny pant as well. Her hair looks simply amazing, so thick and full of body. I’m not so sure about the earrings as I’d be cautious about wearing a sizeable hoop when diving into full-on activity, I have a dread of one of them catching in something and doing my ear some serious harm. Whatever, she looks a million bucks and remains the star of the show as always. I. Love. Those. Boots. The outfit overall is nice and simple, but I wish she would change it up with her outdoorsy jacket here and there. (Realistically I know there’s no reason to, it’s perfectly functional and looks great, I’m just selfish and want to see some new/different outdoor fashion pieces on her.) You can tell this is exactly her element and enjoyment. And those legs, wow do they look great in skinny jeans! Perfect look for this event! 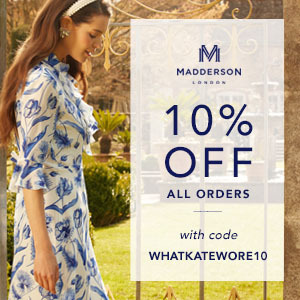 I love the photo of Kate inside the den. She is truly full of joy around children and the outdoors. The skinny jeans look perfect today! Somehow they seem more skimming and not skin tight today…or is that just me? I think she looks perfect! Kate looks fine although once again I think her pants are too tight. She is an awfully good sport and great with children. 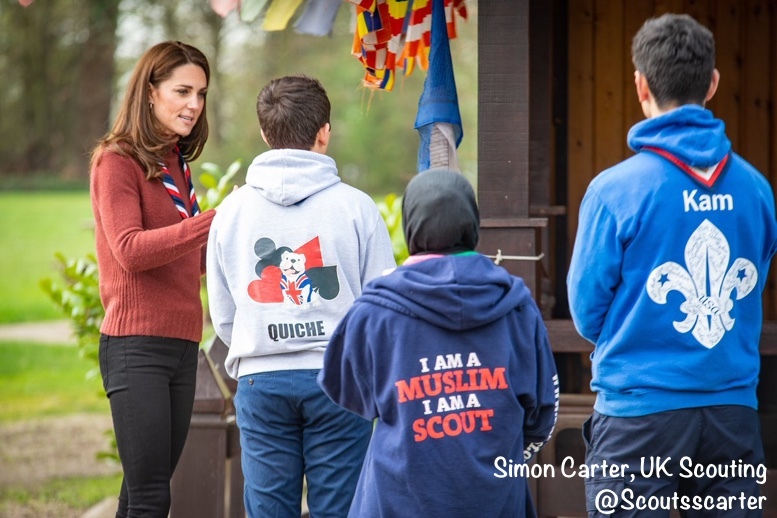 Nice that she is wearing the Scout neckerchief, but it would be wonderful for the organization if she, as a volunteer, actually wore the compete uniform. When I served at the National of Girl Guides of Canada, our patron was the Governor General (the Queen’s representative) if a woman, or his wife, if the GG was a man. We always gave each lady a uniform and she would wear it to all Guiding events. It was great PR. Scouting and Guiding do so much to teach children skills and values with emphasis on the environment. I do hope George, Charlotte and Louis get involved. There was once Brownie and Girl Guide Units at Buckingham Palace where the young princesses, Elizabeth and Margaret, were members. If she is an occasional helper and not a fully appointed leader then she would be a non uniformed member of the Scout Association. Therefore no uniform to wear. People choose to be occasional helper for many reasons but some do so because they don’t feel 100% comfortable wearing a uniform. This is unlikely to be Catherine’s reason, but it gives an indication of a basic difference between the two roles. Ceejay, As I said above, GGC gave a uniform to the patron to wear to events. We were not expecting her to be a fully appointed leader working with the girls. Many members of the Royal Family wear military uniforms in an honouary capacity, in regiments where they don’t actually serve. It was more this concept that I thought would be nice for Kate to don a Scouting uniform. But of course, she has every right not to be in uniform. This was the Cambridge trifecta: the outdoors, kids, and fabulous Kate. Terrific engagement and a wonderful look for her. I was not a fan of the boots the first time I saw them, but I think they may be growing on me. Kate wears the hoop earrings well. They’re not too big, and maybe that’s why they work without looking tacky. 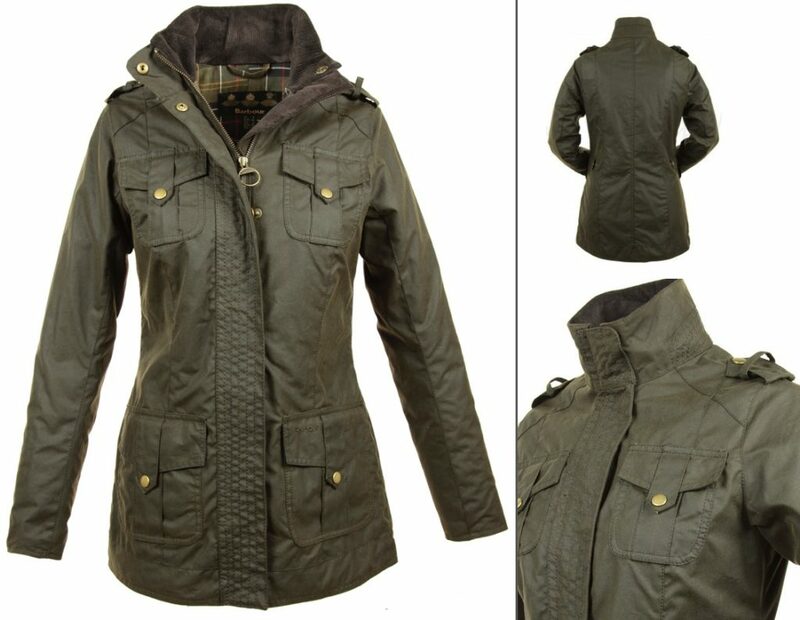 Love the Barbour jacket– it’s always nice to see it on her. Keep the great posts coming! Perfect. Just perfect! This post really warms my heart. 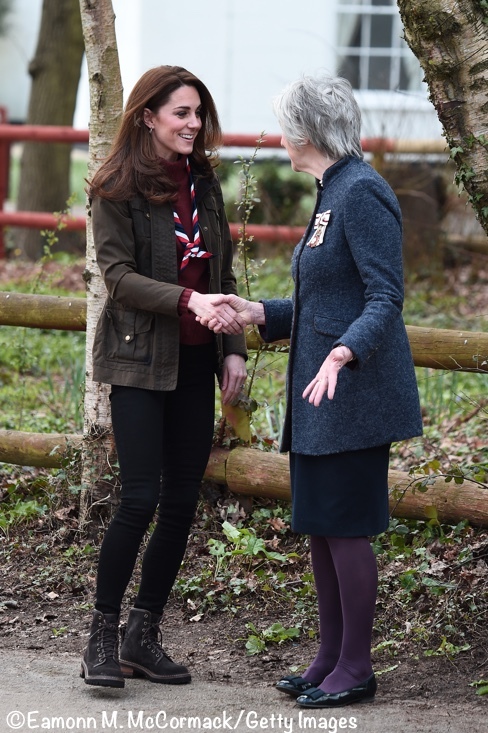 Kate looks so genuinely engaged and her smart and unfussy casual wear adds to her fitting in brilliantly. It’s outings like this that make me (almost) forget that she’s not just a “normal” mum. I especially love that she wore the scarf and am curious about the pants as they don’t bother me like the usual skin tight ones she normally wears. The jacket is to die for in my book. And the earrings are a wonderful addition to her wardrobe, too! Lovely. Kate is a natural with those youngsters. She seems like such a good Mum. I do think she’ll be a good Queen. She does remind me of the Queen Mother in her ability to get along with people. Smiley, kind lady with a gung – ho attitude. As far as the clothes go, Kate looks lovely. I’m not a fan of Barbour jackets but that’s just a personal thing and it wouldn’t matter who was wearing it. It’s her thing and is a lovely, appropriate outfit that suits her. I love the comparison with the Queen Mother. That’s very apt. Thanks Rachael. I’ve just always had that thought with Kate. I think she has a great sense of duty but she also exudes warmth and kindness. 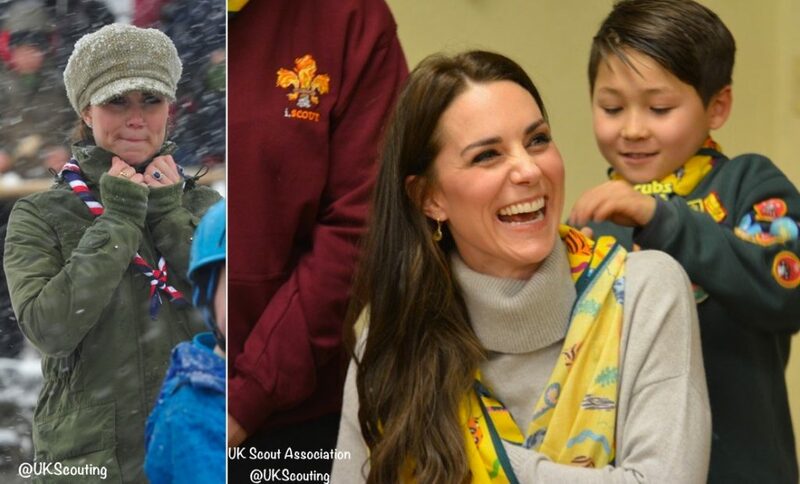 I love that she wore the Scouts scarf. That is adorable. And Kate in hoop earrings? I am shocked!! I love it! I would not have guessed that she even owns a pair of hoops. The Duchess really looked in her element today, what a fantastic organisation, so wonderful for the children, actually for all ages. I love to see the Duchess on occasions like this, she gets in and participates, that is what it is all about . She looked appropriately dressed, and looked terrific. This J. Crew sweater is great. I think it’s the only item of Kate’s that I also have in my closet! Great ensemble for the outdoor activities with the Scouts. And love, love the jacket! A lovely and practical, if not predictable, outfit for the engagement today. Thanks for the post. 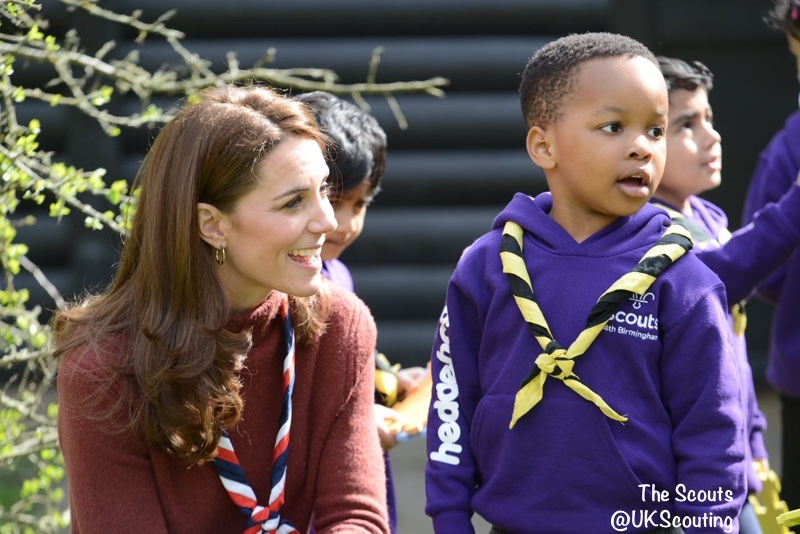 I’m looking forward to seeing the prince in his adorable little uniform on his first day of Scouts, if they decide to release a photo! Oooo, those boots are giving me life! I love them! I enjoyed this comfy & cozy look for the duchess. The colors look more Autumn than Spring to me, but the tonal colors blended beautifully with the brown foliage. 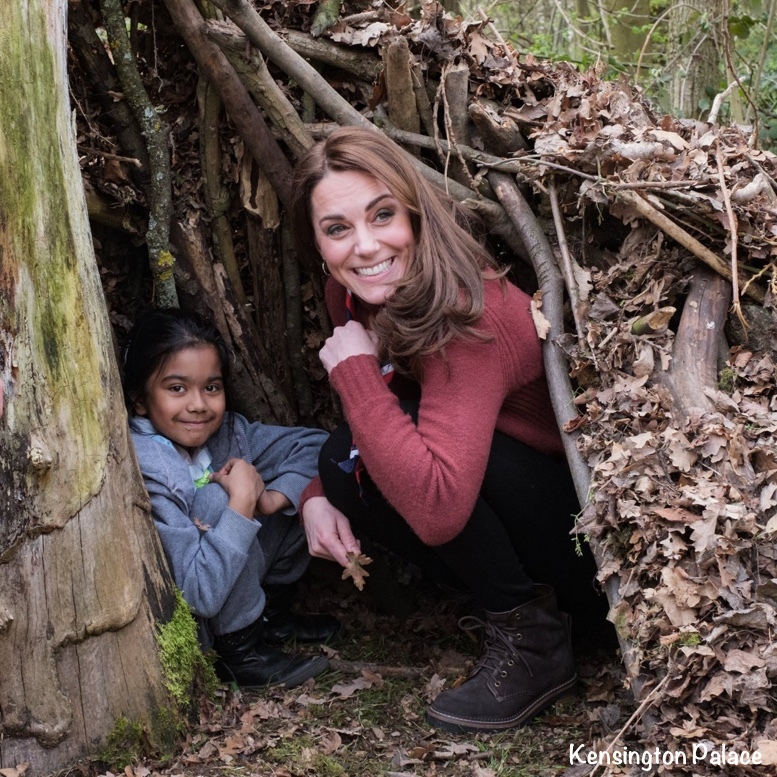 That photo of Kate inside the den was so adorable! 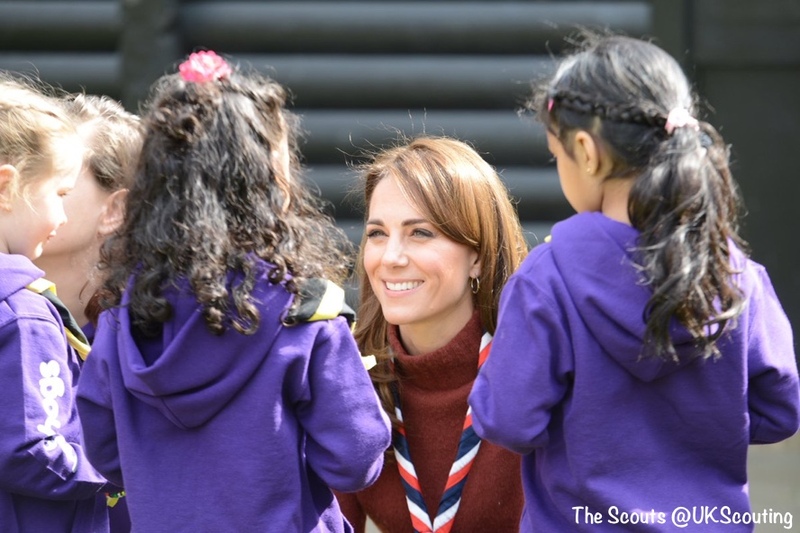 Looks like she really got involved and interacted with the scouts in such an endearing way. Any idea on the brand of pants she was wearing? Full marks for the pretty square knot on the scarf! Great outfit – perfect for the elements. I love the berry color. (I’m less fond of the green).